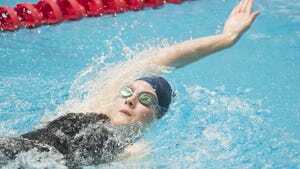 MECHANICSBURG – Kacey Oberlander knew where her opponents were towards the end of the District 3 Class AAA 100-yard backstroke on Saturday. Of course, the Dallastown senior also knows she is a great second-half swimmer. Close after 75 yards, Oberlander pulled away in the final 25 and ended up winning by more than a second with an All-American time of 55.68. Combined with Friday’s 200 individual medley victory, Oberlander left the Cumberland Valley pool as the first Wildcat girl in more than 20 years to win two individual district gold medals. “That feels pretty good. It’s fun doing it for the team, and fun getting out here for Dallastown,” she said. Up next is the PIAA Class AAA championships, which will take place at Bucknell University from March 16-19. Oberlander admits to be looking ahead. “It’s already on my mind. As soon as I touched the wall,” she said of a trip to states. Speaking of the state meet, having to wait to see if he qualified for it was something Alec Peckmann of Central York hoped to avoid. As a freshman last season, Peckmann waited to receive an at-large berth to states. While he made it in 2015, placing in the top three at districts earns an automatic berth. On Saturday, Peckmann ended the suspense when his time of 46.46 earned him a silver medal in the 100 freestyle. Peckmann will also swim the 200 free at states after his second-place finish on Friday. But he was happier after day two of districts. “I am a lot more pleased than I was yesterday. Even though I had the same time drop, this was the 100. It just felt better all around,” he said. Like Peckmann, Red Lion’s Dylan North is glad to get an automatic berth to states as opposed to having to wait to receive an at-large like he did last year. North’s time of 4:39.48 in the 500 free earned him a bronze medal and trip to Bucknell. “It felt pretty good. I had a guy next to me that I had to compete with until the end,” he said of his race. “I am excited to have another chance to go faster. It’s nice to know I made it as an automatic qualifier." Although North did in fact laugh at himself at the conclusion of the boys’ AAA meet. In addition to the 500 free, he came right back and swam in the 100 backstroke. Back-to-back events, even with an awards ceremony in between, can be challenging – he finished 12th. Dallastown senior Spencer Hill will also return to states after his bronze-medal-winning time of 51.36 in the 100 backstroke. His teammate, sophomore Logan Brockway, won a seventh-place medal in that same race. The Wildcat boys’ 400 free relay earned fifth-place hardware.